This image, created from Philae's ROLIS descent camera, focuses on the largest boulder seen in the image captured at 67.4 m above Comet 67P/Churyumov-Gerasimenko. It is best viewed with red/blue–green glasses. The 3D view highlights the fractures in the 5 m-high boulder, along with the tapered 'tail' of debris and excavated 'moat' around it. 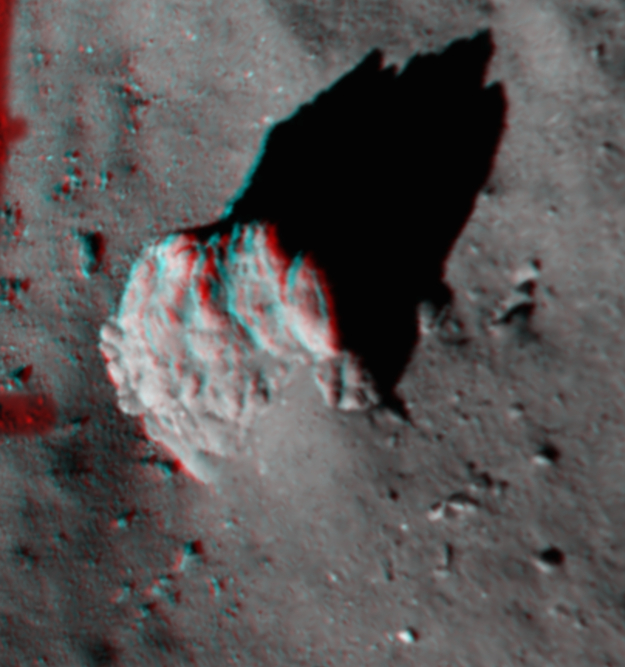 This 'tail' feature has also been identified around boulders elsewhere on the comet in OSIRIS images taken from orbit. The ROLIS team thinks the tails appear as a result of the region 'behind' an obstacle being shielded from erosion via the impact of falling particles arriving in a prevailing direction, perhaps from activity elsewhere on the comet.